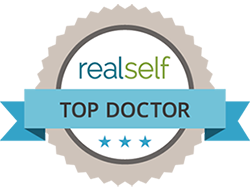 Individual results and healing process varies depending on skin thickness, other factors, and in revision surgery, amount of scar tissue. 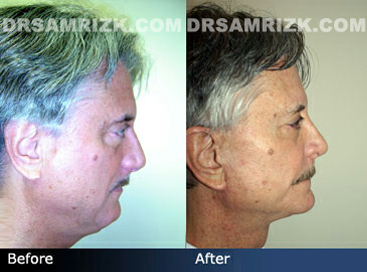 Our 62 years old male patient was concerned about jowls forming on his lower face and neck. 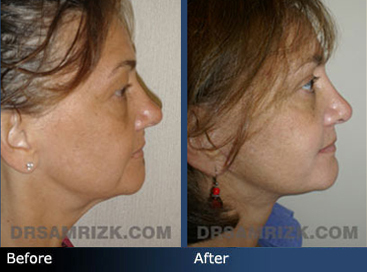 Dr. Rizk performed a neck lift and lower facelift to reduce the appearance of jowls without looking “over-stretched.” The results are seen 3 months post-surgery. 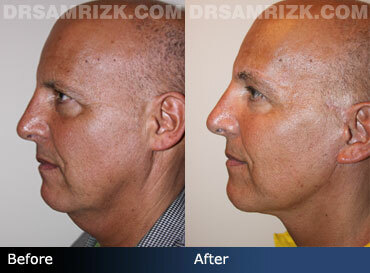 55 year old male patient wanted to improve his jaw line and had a necklift and lower facelift procedure. 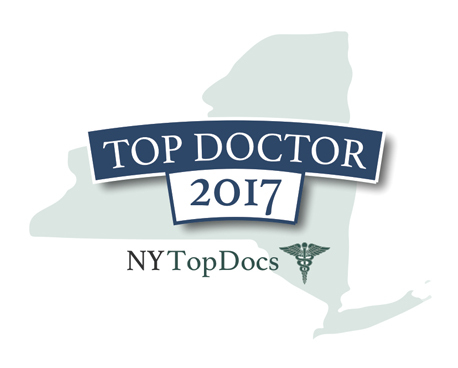 53 year old female patient had an endoscopic brow lift, an upper and lower blepharoplasty, a subtle rhinoplasty, and a facelift and necklift. 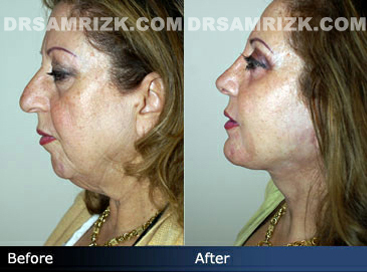 She is shown six months following surgery. 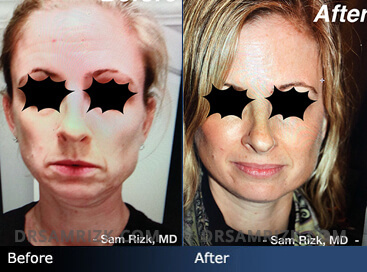 43 year old female patient had a partial lower facelift, necklift in deep plane, upper and lower eye lift, and partial brow lift to improve her neck and lower face. 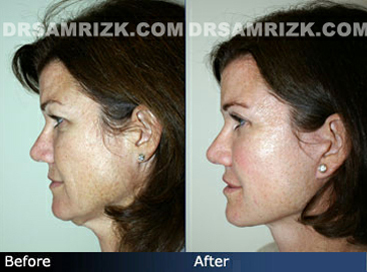 She is shown a year following surgery. 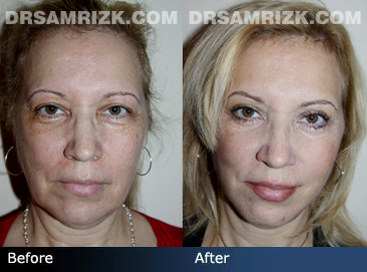 50 year old female patient wanted to revitalize her face and had a facelift, necklift, upper and lower eyelift, endoscopic partial brow lift and fraxel co2 laser on the face. 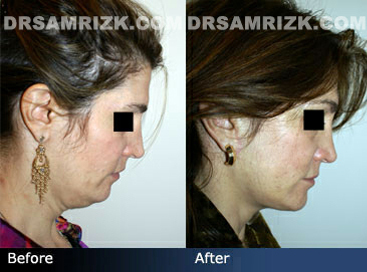 She is shown six weeks following surgery where minimal swelling can be seen, and her jaw line and cheek area is defined. 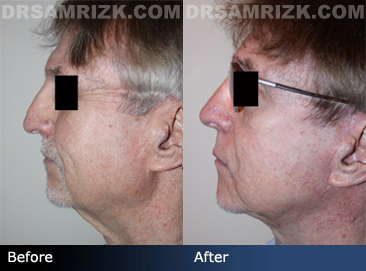 55 year old male patient improved his neck and jaw line by undergoing rapid recovery necklift and jowl lift. 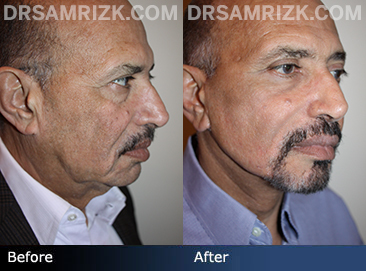 He is shown one week following surgery with a noticeable improvement in his neck contour which will last 10 years or more. 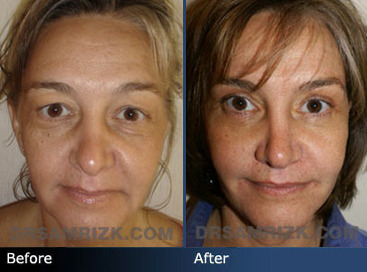 55 year old female patient underwent a facelift, necklift, chin implant, upper and lower blepharoplasty, rhinoplasty, and laser around the eyes and mouth. 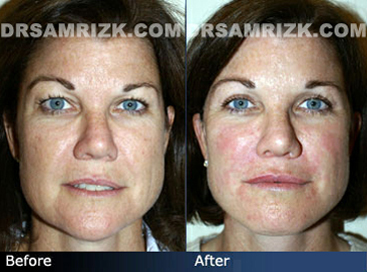 She is shown two weeks following surgery with no bruising, but some swelling and pinkness are noticeable on areas where laser was used. 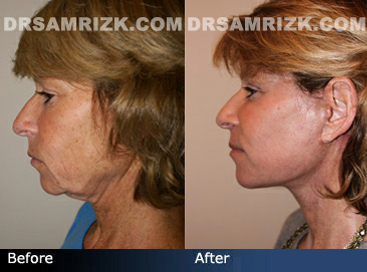 60 year old female patient underwent a necklift. 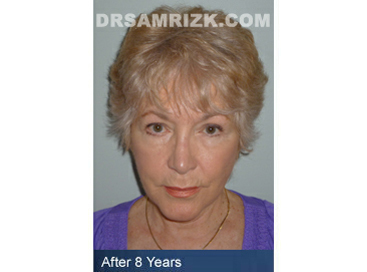 She is shown two years and eight years following surgery respectively. 54 year old female patient had a pulled down eye. 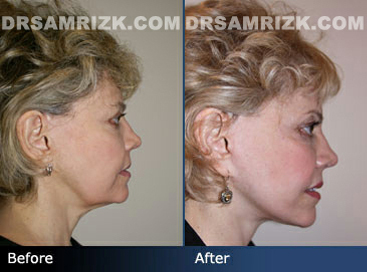 She is shown two years following facelift, necklift, and bilateral lower eyelift revision. 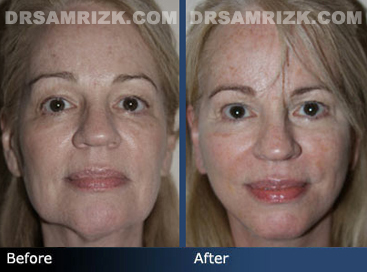 54 year old female patient is shown two weeks following a facelift and necklift using a modified deep plain approach and fraxel co2 laser resurfacing on the face. 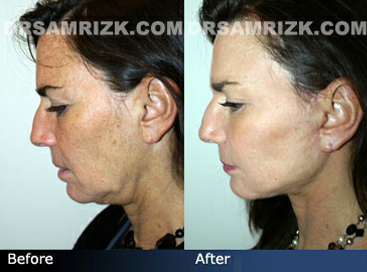 The volume in her cheek and midface region was replenished due to lifting the jaw line. 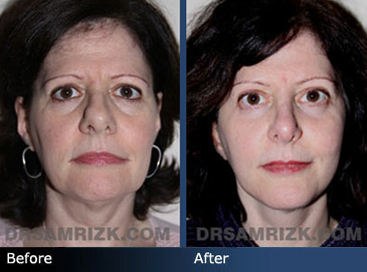 54 year old female interior designer patient is shown two years following a lower blepharoplasty, revision rhinoplasty with a tip lift, and a facelift and necklift. 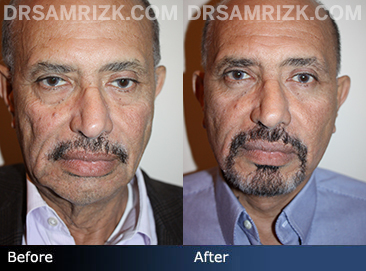 Patient had baggy eyelids and had the fat reduced as well as lower eyelid laser resurfacing to tighten the skin. 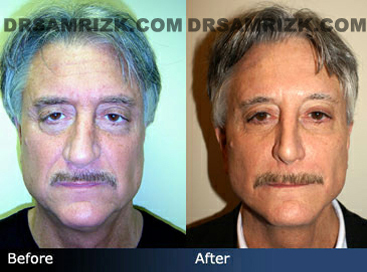 55 year old male patient had a facelift, necklift, and revision rhinoplasty. 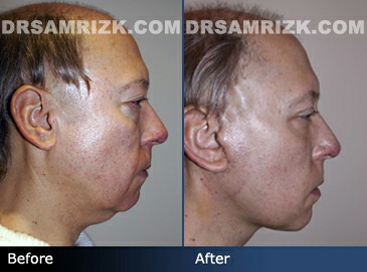 He is shown three years following surgery where a natural neck form with subtle scars around the ears, an improved nasolabial fold and jaw line can be seen. 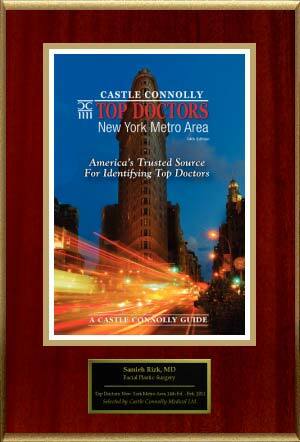 45 year old female patient had a heavy set neck due to genetics and is not overweight. 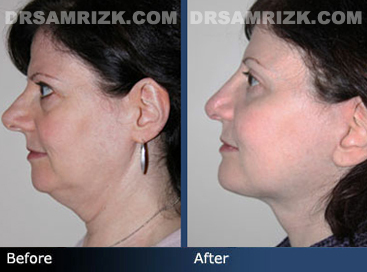 She underwent a necklift and neck liposuction where incisions were made behind her ears and around the earlobe to suspend her central platysma muscle and later platysma muscle. 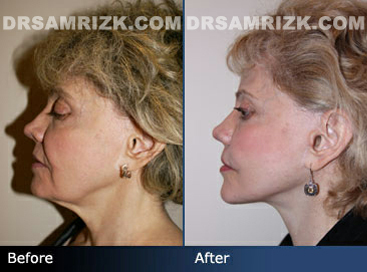 She is shown a year following surgery. 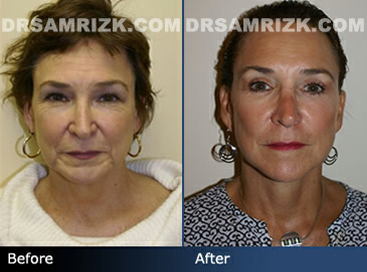 53 year old female patient underwent a facelift, necklift, and revision rhinoplasty. 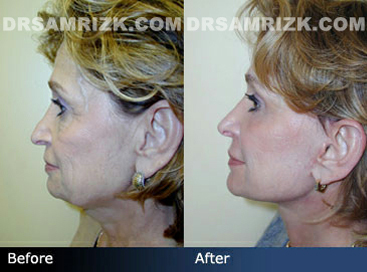 She is shown a month following surgery where her chin is still a little swollen, but her jaw line is defined which can be seen in her profile view. 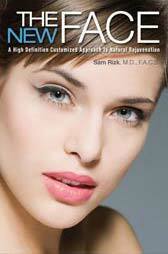 Her jaw line had been repositioned into the hollows under the cheeks, an advantage of modified deep plane facelift. 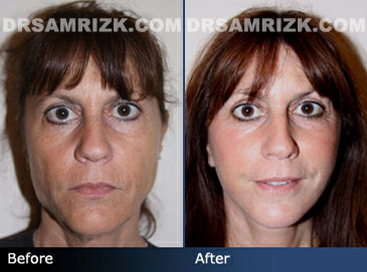 Her face is naturally defined and is not tight or stretched and the square region around her mouth is sculpted following surgery. 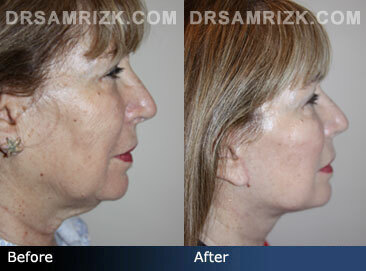 50 year old female patient with a history of sun damage wanted a defined neck and jaw line and underwent a lower facelift, necklift with small incisions and fraxel co2 laser on the face. 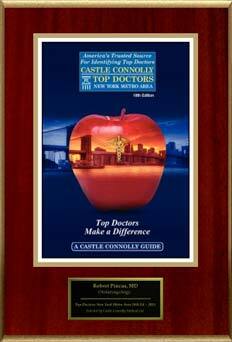 Her neck was further defined by 3D high-definition telescope technology which helped increase visualization, safety and expedited recovery. 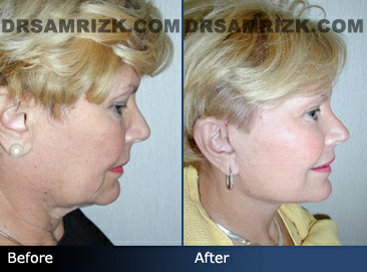 She is shown three weeks following surgery, where her neck is clearly defined with unseen small scars inside her ear. 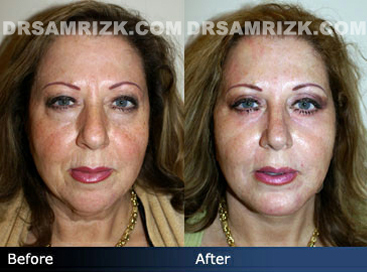 55 yo patient interested in improving her brows/eyes and lower face and neck. 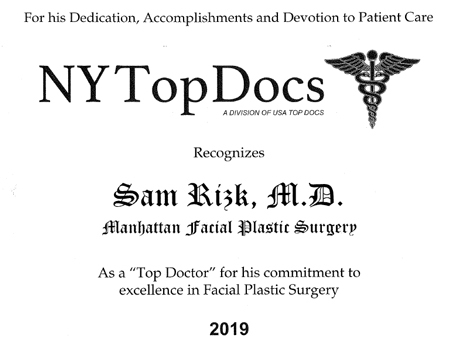 Patient underwent lateral or temporal browlift, upper blepharoplasty, lower blepharoplasty and lower facelift/necklift with midline platysmaplasty. Patient is shown 1 year postoperatively. 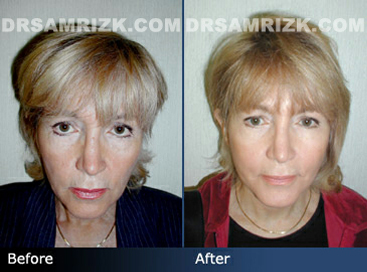 60 year old female patient had a facelift, necklift, upper and lower blepharoplasty, a full face laser and brow lift surgery. 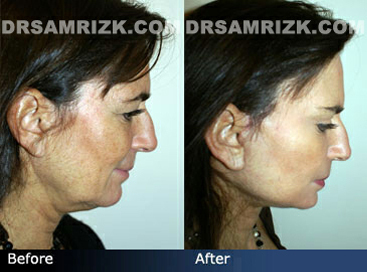 She is shown two years following surgery. 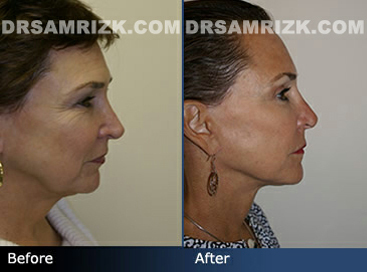 58 year old female patient wanted to improve her neck and jaw line and underwent a necklift and partial lower facelift. 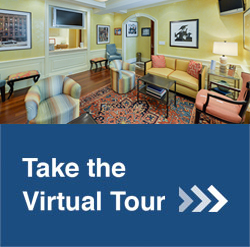 She is shown a year following her procedures. 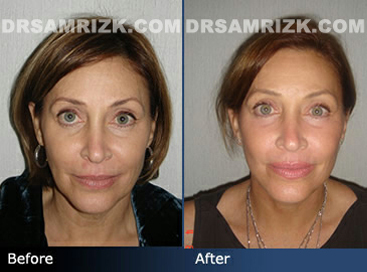 54 year old female patient wanted to rejuvenate her face and underwent a facelift, necklift, and blepharoplasty. 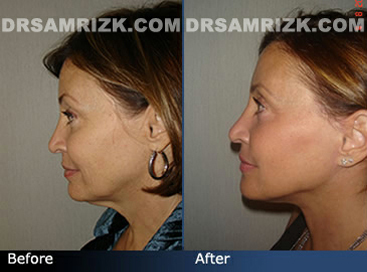 She is shown one year post-op where significant improvement can be seen in her neck and jaw line and a natural frontal appearance that is not stretched out and tight. 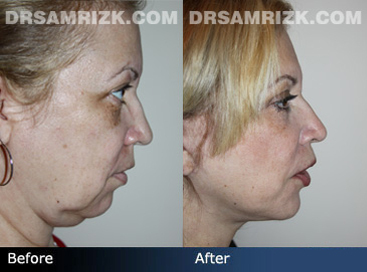 55 year old female patient had a facelift, necklift and midline platysmaplasty to eliminate excess fat under her chin and to tie her muscle cords together. 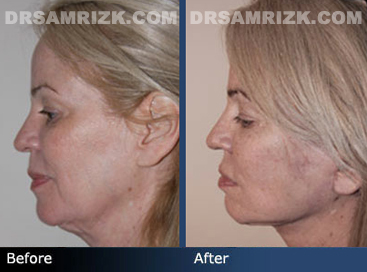 Dr. Rizk combined the midline platysmaplasty with a facelift to define her jaw line and help give her a longer lasting enhancement of the neck where fat accumulated. 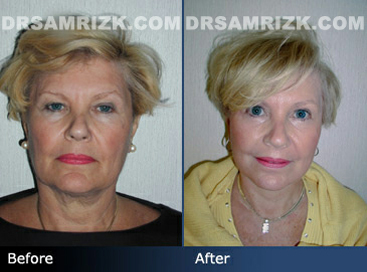 55 year old female patient underwent a facelift, necklift, upper and lower eyelift, and fractionated co2 laser procedure. 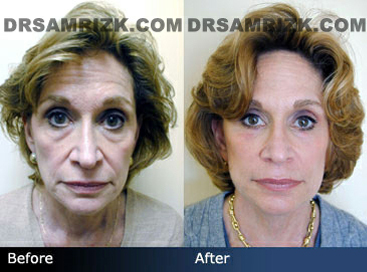 She is shown a year following her surgery. 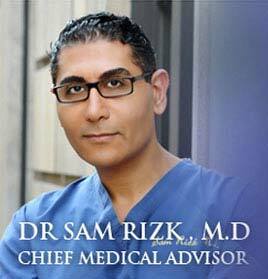 Dr. Sam Rizk used HD telescope technology to visualize her neck and to minimize any scars which are concealed within her ears and under her chin where midline fat was removed and her platysmal muscle cord were joined. 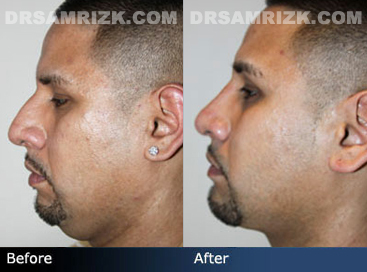 33 year old Latino male patient wanted a balanced and defined facial structure and underwent a rhinoplasty, necklift, and a chin implant. 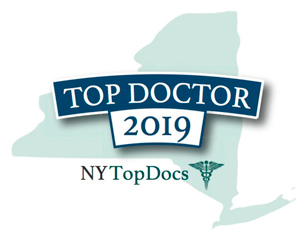 Dr. Sam Rizk performed a muscle tuck procedure with a small incision under the chin using 3D telescope to help the patient achieve more definition than normal liposuction. 16 year old female patient was concerned with fat deposits building under her chin that was happening with a normal body weight. 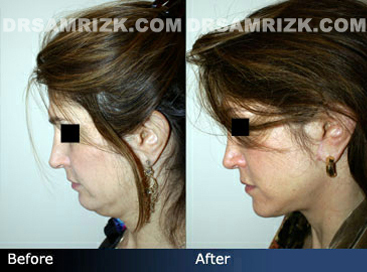 She had a chin augmentation and neck liposuction to correct it. She is shown a week following surgery where minimum bruising can be seen. 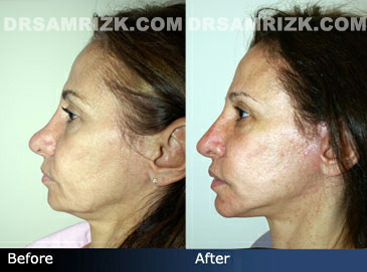 46 year old female patient was unhappy with the size of her nose and a lack of definition on her face. 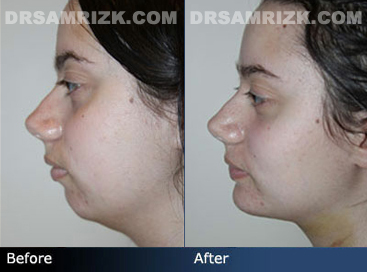 She underwent a neck liposuction with rhinoplasty where subtle adjustments were made and the tip of her nose was slightly lifted. She is shown before surgery and a year following surgery and has fully healed and recovered from swelling. 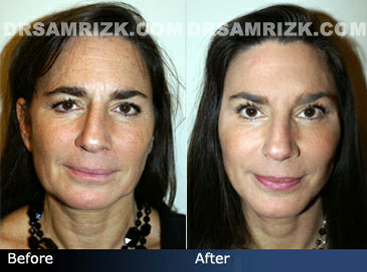 45 year old female patient wanted to rejuvenate her face and receives a facelift, necklift, eyelift and subtle rhinoplasty. She is shown two weeks following surgery. Although still slightly swollen, a noticeable improvement can be seen. 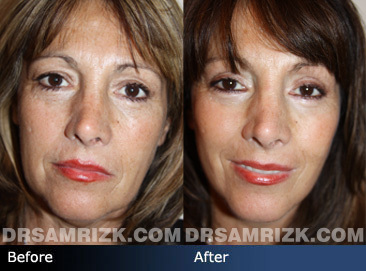 56 year old female patient wanted a variety of facial improvements which included a necklift, facelift, partial brow lift, rhinoplasty and blepharoplasty. Patient is shown after fully recovering from the procedures. 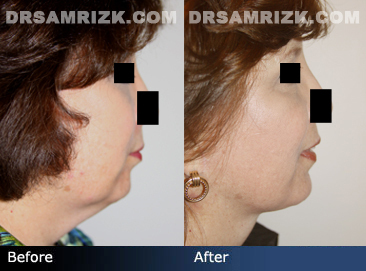 Female patient wanted a facelift and necklift to define her cheek and jaw line and received a fat injection around her chin area to balance her chin and face. 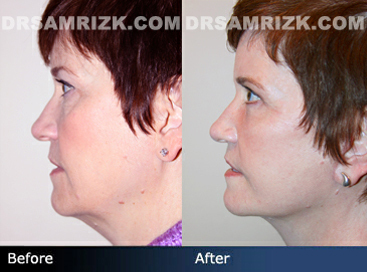 Patient is shown two weeks post-op and although swelling is still visible, a more defined cheek and jaw line can be seen. 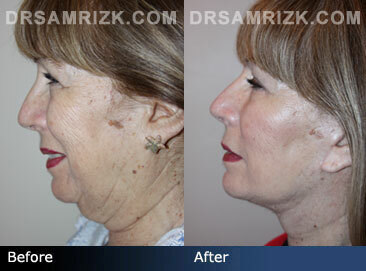 55 year old female who underwent lower facelift and necklift as well as midline platysmaplasty. 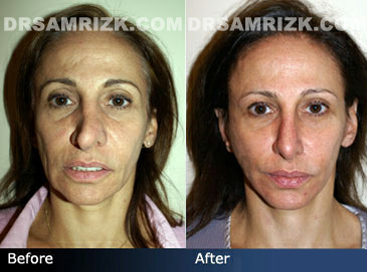 Patient is shown 1.5 years after the facelift. 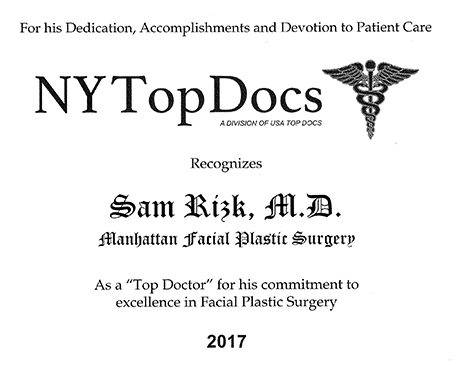 75 yo male interested in improving his drooping nose and loose neck. 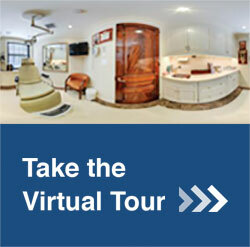 Patient wants a very natural procedure. 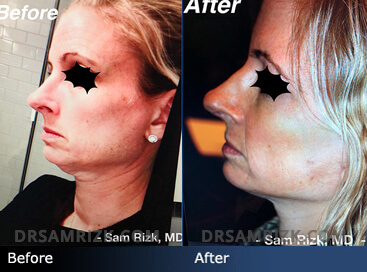 Patient underwent endonasal rhinoplasty to lift nose tip and bump reduction conservatively as well as a lower facelift and necklift. Patient is shown 6 months postoperatively. 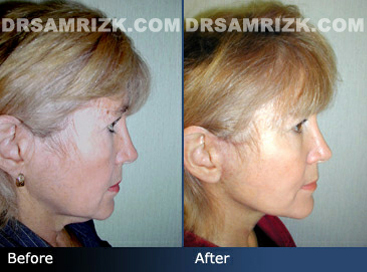 67 yo female who underwent necklift and lower facelift and midline plastysma placation. 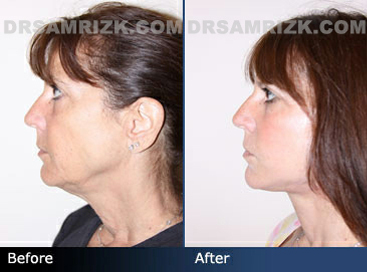 Patient is shown after surgery with a much more defined jawline.